When an Alternating Current flows through a conductor, it is not distributed uniformly throughout the conductor cross-section. AC current has a tendency to concentrate near the surface of the conductor. 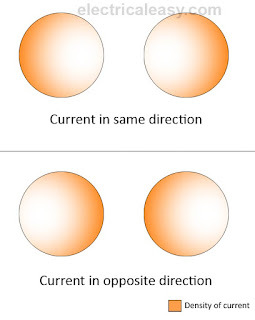 This phenomenon in alternating currents is called as the skin effect. Due to the skin effect, current is concentrated between the outer surface of the conductor and a level called as the skin depth (skin depth is shown by ẟ in the following figure). If the frequency of AC current is very high, the current is restricted to a very thin layer near the conductor surface. Skin effect increases with increase in the frequency. Due to skin effect, the effective cross-section of the conductor through which the current flows is reduced. Consequently, the effective resistance of the conductor is slightly increased. Imagine a solid conductor split into a large number of strands, each strand carrying a small part of current. The inductance of each strand will vary according to its position. Strands located at the center would be surrounded by a greater magnetic flux and, therefore, will have a larger inductance than those near the surface. Higher inductance (and hence, higher reactance) of the inner strands causes the alternating current to flow through the strands having lower reactance, i.e. near the surface. 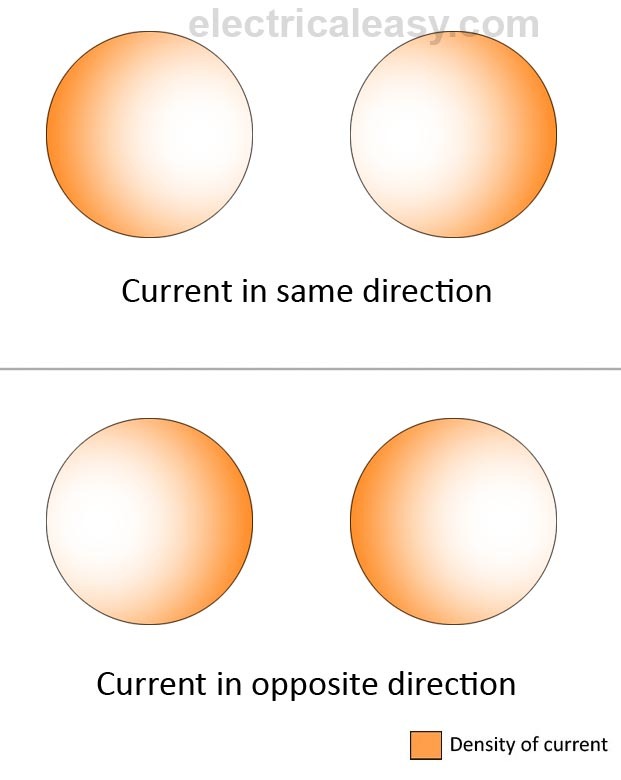 When two or more conductors carrying alternating current are close to each other, then distribution of current in each conductor is affected due to the varying magnetic field of each other. The varying magnetic field produced by alternating current induces eddy currents in the adjacent conductors. 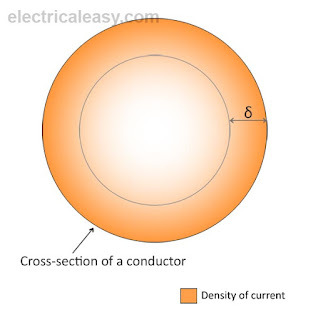 Due to this, when the nearby conductors carrying current in the same direction, the current is concentrated at the farthest side of the conductors. 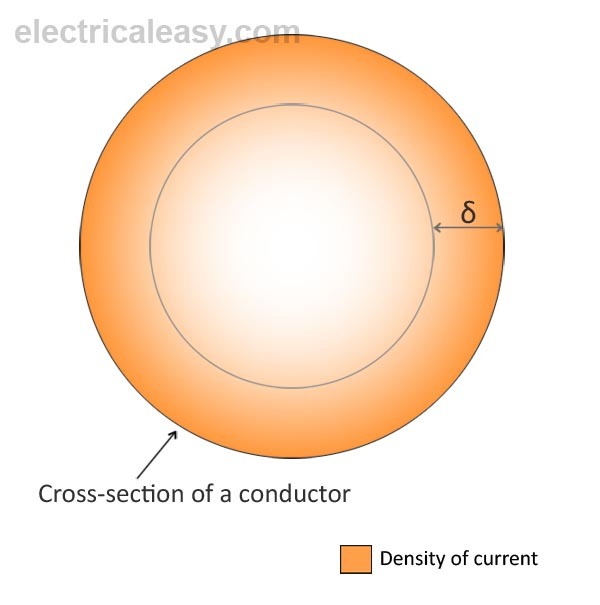 When the nearby conductors are carrying current in opposite direction to each other, the current is concentrated at the nearest parts of the conductors. This effect is called as Proximity effect. The proximity effect also increases with increase in the frequency. Effective resistance of the conductor is increased due to the proximity effect. Skin effect and proximity effect both are absent in case of DC currents, as frequency of DC current is zero.